Tomatin Whisky - Water — NORTH BLOG. TOMATIN - THE SOFTER SIDE OF THE HIGHLANDS. Today we embark on our Tomatin Route 501 Whisky Adventure. We worked in collaboration with the Highland distillery to create an adventure that helps with my understanding the fine art of creating whisky, but also to become at one with the new Tomatin ‘Five Virtues’ whiskies, Water, Fire, Metal, Earth and Wood. Whilst I will enjoying the whisky, Jawn was along to capture the magnificence of this adventure. This journey is going to be exciting. Myself and Jawn came up with five challenges combining visiting beautiful places in bonnie Scotland with the goal of completing a task at each location within a certain time frame. We will be exploring areas around the North of Scotland that we have never visited before, I will be tasting whisky in ways it has never been tasted, all whilst indulging and immersing ourselves in nature’s elements as I enjoy a wee dram. Where better to undertake this whisky adventure than on the NC500 - Scotland's answer to America's Route 66, circling the country. Tomatin just off this route – a perfect start and finish point – hence the Tomatin Route 501 whisky adventure. First things first though, we needed to make sure that we have a camper van as this is always a great idea when you are road tripping. Myself and Jawn did some research which led us into finding a family run camper van business called Cairngorm Campers. Always support local businesses! As we arrived at Cairngorm Campers there was no one to be seen, and we asked ourselves for second “Are we in the right place?” then we heard someone shout “Be with you in a minute, tending to my bees right now”. A friendly gentlemen came over with his dog, his arm was swollen like a balloon, but he was laughing and saying “Ooooh it’s not that bad, just a few wee stings”. I found his response to it hilarious, and I instantly got good vibes. Anyone with a dog who also has their own bee garden taking care of and helping save the bees, whilst laughing off the battle wounds they get in the process has to be a pretty good person in my books. We got a quick rundown of the camper van which took no longer than ten minutes then off we went. We headed south of Inverness taking us to the Tomatin Distillery. Myself and Jawn both very excited about having this opportunity of a personal tour from the Tomatin Brand Ambassador Scott Fraser. Then after passing through the shadow of all the black buildings you will start to smell the aromas kicking about in the air. This is something that obviously needs to be experienced first hand. As we parked up we headed to the main office instantly being greeted by Scott, who was a lovely cheery gent with a big smile giving us an energetic warm hearty welcome to the home of Tomatin Whisky. Good vibes are flowing everywhere today and it’s awesome! 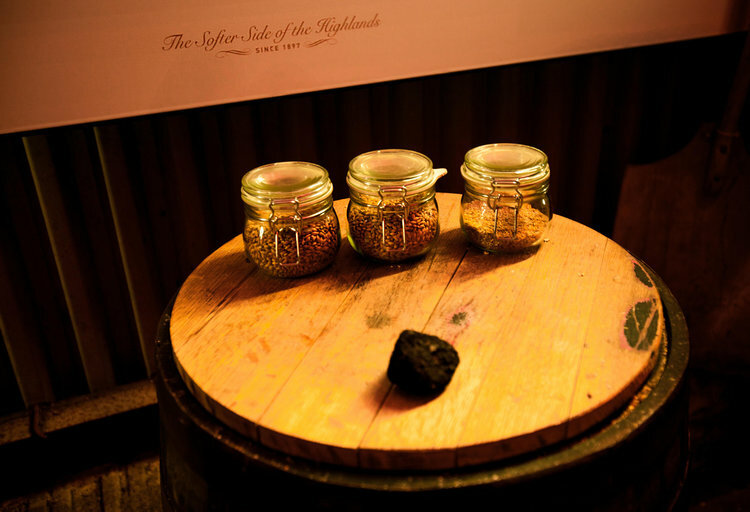 He took us from building to building, letting us get hands on with rolling some barrels, smelling all the different ingredients involved in the making of whisky, giving us a true insight of how the magic happens. The science, thought process and knowledge from experience that is put into making these fine whiskies is something that is unbelievable until you see and hear it, and it really makes you feel proud of being Scottish knowing how our nation has got this art down to perfection. After a few hours exploring the distillery, learning from Scott everything we needed to know about whisky, it was then onto the whisky tasting. Yes l said it; a whisky tour is never complete unless you get to taste the products right? It would be rude not to after seeing all the hard work that goes into the process. He took us into Tomatin’s tasting room, and as we sat down at this beautiful wooden table we realised we were surrounded by some of the finest bottles of Whisky that Tomatin has ever created. I felt very privileged having the opportunity of being in this room among these masterpieces. He then leaned over and said “Ok Tristan are you ready?”. One, two, three, four and five drams later, I had been whisked away into experiencing the five virtues of Tomatin. Scott had given me a glass full of each of the whiskies, teaching me their story and the true correct way of drinking them to experience that story in full, and explaining in full details how the five virtues each got their flavours. After all, the ‘Five Virtues’ were why we were on this trip. This visit is by far one of the best history lessons that I have ever had. Who thought a history lesson could be so much fun? The history of whisky is an interesting one. Unfortunately Jawn couldn't drink, but I got to taste all these fine whiskies whilst he had a smell of each one of the ‘Five Virtues’, which was rewarding in itself. After an exciting afternoon with Scott in the distillery it was time to leave, we had an adventure to start. Our first challenge of the ‘Five Virtues’ Whiskies is WATER. We wanted somewhere beautiful and accessible where we could hear the sound of water trickling down the rocks and maybe even with a waterfall or two in the background if we were lucky. Being in Scotland we knew just where to go and lucky we were, as we both decided the Fairy Glen Falls in Rosemarkie was the perfect spot. Fairy Glen Falls is known for two beautiful waterfalls which set the scene for old ceremonies where people, especially children from the village decorated the spring by placing flowers in and around it, and making small offerings whilst singing songs to make sure the Sìdhichean or fairies as they are called, were happy so that they would take care of the water and keep it clean. Spots they took care of were thought to contain healing waters. Our challenge was to enjoy a wee dram of the Tomatin ‘Water’ Whisky and a wee dram of fresh Scottish water from the waterfalls. The walk through the woods following the stream upwards was gorgeous, the smells of beech, rowan, ash and oak trees filled the air with a sweetness that made our walk that much more magical. We had not even reached the waterfalls and already we were in awe of everything. Finally we reached the first waterfall, which was stunning; we sat and took in the sights before making a few more short steps up the pathway to reach the final waterfall. Finding a nice comfortable place in the area to have a seat taking it all in with a big deep breath, I took my Tomatin whisky glass out of my backpack before cracking open the bottle of Tomatin ‘Water’ Whisky and pouring myself a wee dram. I took my boots and socks off and was soaking my feet in the Fairy Glen Falls Water before having a drink, which didn’t last long. It was very good dram and almost felt like it cleansed and refreshed me! Slowly with my now empty glass I make my way over to the waterfall so I can enjoy a nice fresh glass of Scottish water from the Fairy Glen Falls. Everything seemed to fall into place, and I was caught in a moment of realisation. l chuckled to myself as l remembered Scott saying to me about the element of surprise in a bottle of whisky, and this was it. I was experiencing exactly what he had said and what I had hoped for. I could feel and understand the connection to the water element, I could feel the history, l could visualise and sense the flow of how the water adds to the magic of the whisky creation. Filling up with this honest, pure and refreshing cleansing feeling just like a swim in one of our amazing loch's that Scotland is famous for, and just like the dram. A part of the secret within a bottle of Tomatin Scottish Water Whisky is that this healing, refreshing water is an important part of our culture, our homeland, and with a purpose has flown through the beauty of all that has been here, and many have came and paid respect to it, whilst tasting it because of its gift. Water is vital to our survival and I know how we must protect our water sources but I had never thought about how important or meaningful water was to the process of whisky creation, but I now know, and this is still only the beginning of our adventure. It was time to leave this beautiful area to drive North East where we ended up arriving late at Portmahomack Campsite to get some rest before our adventure continues the next day.